Sets in Africa are almost only made for the tourist market. South of the Sahara there exist hardly any chess tradition. I believe there is one chess grandmaster at the moment. Please correct me, if I’m wrong. In northern Africa chess was played indeed. 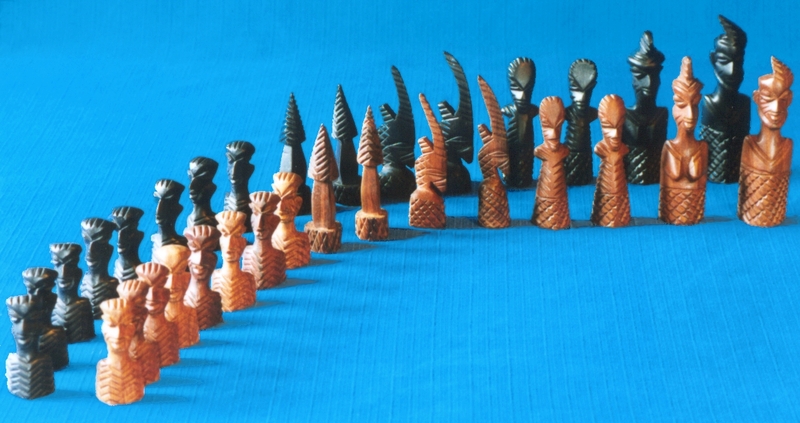 Throughout Africa chess sets are made in workshops where they make other things as well. The book of Ned Munger is a valuable source to learn about African chess sets. Egypt A very large and better than average carved bone set with motives typical for these type of sets. The 2nd set has similar motives, but is very crudely carved. These sets were made for the tourist market. Kenya sets of Kisii stone exist in several sizes, colours and themes. In the examples there is a theme with animals, the others are tribal figures. The grey one is the most common pattern of these sets, although the grey colour is less common. The red with black set is similar but better carved as average and in unusual colour. White and pink are the most common colours. In the examples you see small variations (mainly King). The very large set is rare. Kisii stone, to my knowledge only found in Kenya, is a rather soft kind of soapstone with is easy to work with. The skilled carvers do use primitive tools and after the carving the pieces are rubbed with coconut-fat or coconut-oil, which gives them their beautiful luster. These sets are made by the Abagusii, also called Kisii people, in Kenya for the tourist market. Although I did had several chess sets, all given to me, I was not considering myself a collector until I bought the animal theme set on the artisanal art market in Avignon in 1996. It was the very first set I bought myself, just because I liked it. Madagascar set of above average quality. King Andrianampoinimerinatompokoindrindra (1777-1810) founded, after domestic battle, the Merina (or Hava-) kingdom. Legend is that the kingdom was founded at the place where a spontaneous source arose when the King put down his staff on the ground. The simple staff became the King skepter. The Merina tribe is the largest ethnic group among the 19 Madagascar tribes and covers 26% of the population. Malawi has several larger workshops, where, among other things, chess sets are made. These sets do have a tribal theme always. The wood used is very hard and it is amazing that they can carve that beautiful in it. The quality of the carving is often above average, according African standards of course. I do like these African sets very much. An uncle of my wife lived and worked for 50 years in Malawi, and he brought the first set you see listed here to the Netherlands. Mozambique. The Makonde are an ethnic group in southeast Tanzania and northern Mozambique. They are well known to their carvings of traditional household objects, figures and masks. Their chess sets are very recognizable with the headdress King, Queen and Bishops have, the giraffe as Knight and the traditional hut as Rook. Sets can be heads only, bustes or whole bodies. Animals like apes or birds are loved themes as well. This set is believed to be from Mozambique. Some say that the sets from Mozambique are better carved as sets from Tanzania. At least do they have more decoration. I'm not that convinced about that theory. See Tanzania page. Nigeria. This cutting art from thornwood is thought to have started in Owo, Nigeria by Justus Dojomo Akeredolu, craft teacher at a public school in 1930. He wanted to find a substance, which was easy to cut and suitable for small details. He began to experiment with the wood of the thorns of the silk cotton tree. He learned the cutting art with this wood to its pupils, and today it is a narrative cutting art of detail and ability, showing daily performances of life in Nigeria. The thorns have shades of golden yellow to chocolate brown. Skilled cutters are using that to create special effects. I have never seen thornwood sets painted. These sets are made by the Yoruba for the tourist market. In the original design represents white the Yoruba and black the Hausa. The White King is an Oba, with veiled dressing. Also the black King, an emir, has a veiled dressing. In the later version, of which 2 examples are listed here, is the original topic no longer understood. The distinction between the two parties is gone. The King is carried out as a man with crown or hat. The 1st set has a woman veiled in dressing, exactly as the Oba in the original design, but now as queen. A change of persons has taken place here! The box of that set as an Oba in relief outstretched on the cover. This pattern and monoblock type of set is quite rare, despite you see 2 here. Nigeria. The third set is a rather common pattern of sets made in thornwood. In this kind of sets are pieces made in parts which are glued together, creating more colourful pieces. Tanzania. The Makonde are an ethnic group in southeast Tanzania and northern Mozambique. They are well known to their carvings of traditional household objects, figures and masks. Their chess sets are very recognizable with the headdress King, Queen and Bishops have, the giraffe as Knight and the traditional hut as Rook. Sets can be heads only, bustes or whole bodies. Other themes like animals exist as well. Note the reversed headdress of King and Bishop! Tanzania. Animals like apes or birds are loved themes as well. Some say that the sets from Mozambique are better carved as sets from Tanzania. At least do they have more decoration. I'm not that convinced about that theory. See Mozambique page. Zimbabwe sets from soapstone are less common than the kisii stone ones from Kenya. Striking at these sets from Zimbabwe is that the Knight is also a human figure. I do not know much of the first 2 sets. Actually they let me think of the sets from Malawi. Zimbabwe. Of the third set could seller not tell me age or origin, but in Munger is a similar set from Zimbabwe. Zimbabwe. The wooden set consist of animal figures: King and Queen are lion and lioness, Bishop is rhino, Knight is water buffalo, Rook is elephant and pawn is hippo. All animals are on a conical base.